Yasmin joined Leicester Print Workshop in October 2017. Formerly the Director of Fermynwoods Contemporary Art in Northamptonshire for eight years, Yasmin was instrumental in developing the organisation; curating and commissioning new work and creating an annual county wide programme that has brought arts and non-arts audiences together. Her experience in strategic planning, fundraising, building partnerships as well as collaborating with artists and her role as a leader in the region’s cultural sector will serve LPW well as we continue to grow and extend our impact following our November 2015 move to new premises. 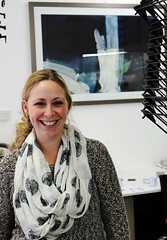 Nichola completed a BA (Hons) in Fine Art Printmaking at Manchester Metropolitan University in 2006. She has been a member of LPW since 2007. In 2008 she became an LPW technician and in 2012 was appointed as our Studio Manager. Nichola also studied a PGCE at Nottingham Trent University and became a qualified teacher for post 16 and above in 2011. Nichola teaches here at LPW on our course programme in a variety of techniques, and also on our education programme within schools and at offsite venues. 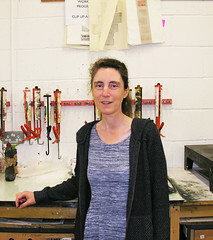 Throughout this time Nichola has exhibited her monoprints and mono silkscreen prints (seen in this photo) at a number of different galleries, exhibitions and at art fairs around the country. Nichola is Mummy to Isaac, River and Hunter and they are very much her life right now, so new work is on hold for a little while, but ideas are always being generated and stored away for some future free time. 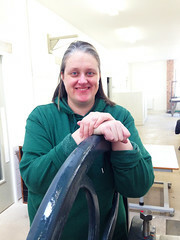 Katharine joined Leicester Print Workshop as a volunteer in 2008 and became our Administrator and Project Worker in 2009. In April 2013 she started working as our Communications and Admin Officer. 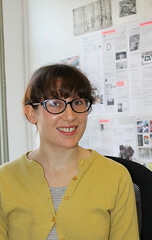 Katharine completed a BA (Hons) in Fine Art at Nottingham Trent University in 2004. During her degree, Katharine concentrated on photographic work using 35mm and 8mm film. Upon completing her degree, Katharine began designing hand-drawn posters for a music venue in Nottingham, and it was this path that led into printmaking and the discovery of Leicester Print Workshop. Katharine is a musician, playing drums in two musical projects, Kogumaza (Low Point/Lancashire & Somerset) and Rattle (I Own You/Upset The Rhythm), as well as the guitar in a variety of projects including Ex-Easter Island Head’s Large Ensemble and most recently Adrian Utley’s Guitar Orchestra. Kate graduated with a BA in Fine Art from Leicester DMU in 2010 and won 3 awards with her final year work, one of which was LPW’s graduate award which saw Kate become a member and volunteer at the studio. Having exhibited her work nationally and been a member of The Attic art collective, Kate became LPW’s AiR for 2014 and spent 3 months based at Compton Verney where she created new work in response to the British Museum’s Curious Beasts exhibition. Kate has a teaching qualification and teaches at LPW as part of our course programme . 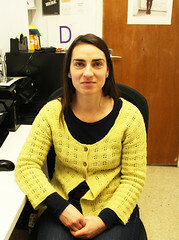 She joined the staff team as a Studio Worker with responsibility for the Education delivery in 2016. Although Kate specialises in etching in her art practice she also teaches monoprint, collograph, drypoint and book making. 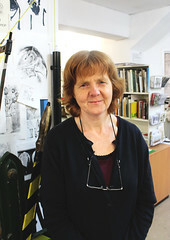 Her wider art practice includes watercolour, collage, sculpture, screenprinting and digital work. She has an unfeasibly large collection of ’70s cookery books. Serena Smith is an artist and printmaker. Following initial study in Fine Art she worked at the Curwen Studio for twelve years where she trained as a studio lithographer and produced work collaboratively for many artists. Her work now includes a range of educational, technical and collaborative projects alongside her own studio practice. Serena’s work on paper is regularly exhibited in the East Midlands and further afield. Serena recently collaborated with artist Richard Devereux to produce new work for the exhibition Practical Dialogue. 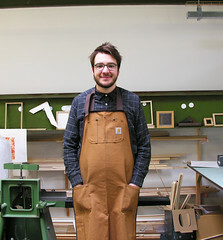 Theo joined Leicester Print Workshop as an Artist in Residence to celebrate Our Big Move. Theo is passionate about printmaking and its many beautiful processes: his artistic practice approaches and reflects this. Theo gained a BA (Hons) in Fine Art at De Montfort University in 2014. There he founded De Montfort University’s Fine Art Society, giving himself and fellow students and artists a platform to curate exhibitions across Leicester. Theo’s degree show work was awarded the LPW Printmaking Prize, through which Theo became connected with the Leicester Print Workshop. See more of Theo’s work here. Elizabeth is Coordinator for the Contemporary Visual Arts Network East Midlands, part of the national CVAN established to help strengthen the visual arts sector in the regions, which is hosted by Leicester Print Workshop. 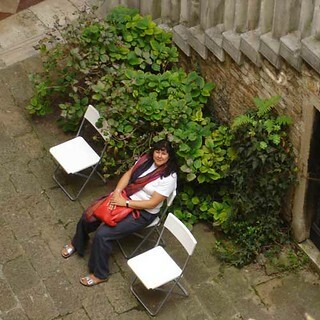 As Coordinator, Liz organises events and projects, promotes contemporary visual arts activity in the East Midlands and creates opportunities for networking and exchange. Until recently, Liz worked as a freelance visual arts practitioner, specialising in project management, workshop facilitation and professional development. She has worked with clients that include UK Young Artists, Birmingham and Coventry Contemporary Art Fora, the Herbert Museum and Art Gallery, Own Art, Turning Point West Midlands, the Royal Birmingham Society of Artists and The New Art Gallery Walsall. She studied History of Art at the University of East Anglia, since which time she has worked at Spike Island, Tate Liverpool and Arts Council England. Whilst she doesn’t have an arts practice herself, she is passionate about the visual arts and particularly enjoys supporting artists to develop their practice. She spends a lot of her free time visiting exhibitions and attending events, as well as enjoying live music, long walks and horse riding. Thomasina started working as a bookkeeper for LPW in January 2013 to fill in a temporary gap and is still here! Thomasina has a musical background, graduating with a music degree from the University of Manchester and going on to study Early Music as a postgraduate at Trinity College of Music in London, specialising in recorders and viola da gamba. Since graduating Thomasina has taught and performed as a musician, worked in admin, volunteered for the National Childbirth Trust, been a learning support assistant and worked for Aimhigher East Midlands. Whilst not being an artist herself, Thomasina loves being part of the LPW community, witnessing all the creativity in the studio and working in the arts again. Kezia completed a BA (Hons) in Arts and Festivals Management at De Montfort University in May 2017. 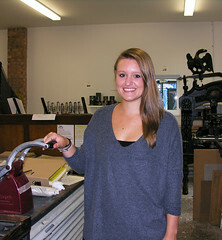 During her degree Kezia took part in a 3-week placement here at LPW, helping with Small Print International. Kezia also completed a 4-week placement at Compton Verney in 2017. Throughout her degree Kezia volunteered at a variety of events and festivals, including The Spark Festival, Dave’s Leicester Comedy Festival, UK Young Artists, and our Making it Happen Symposium, along with helping to organise the Cultural Exchanges Festival as part of her final year at University. Kezia also works part-time at Nando’s and although she has no arts practice herself she has a keen interest in the visual arts.